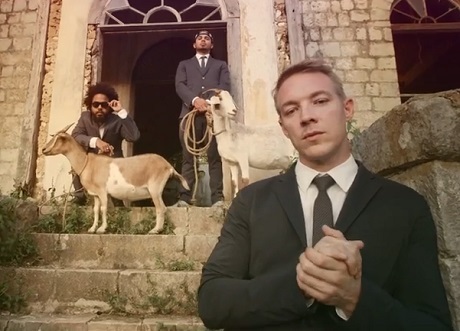 Having just delivered their Apocalypse Soon EP yesterday (February 25), Major Lazer are supporting their set with a cheeky, twerk-heavy clip for "Lose Yourself." Diplo and the rest of the dudes, including guests RDX and Moska, are looking pretty sharp throughout the video in their fancy suits, but more eye-catching are the shiny sci-fi workout uniforms the crew of backup dancers are sporting. A dance party ensues in the tropical setting, with upside-down twerking taking place against trailers, rusty pipes and in a decaying church full of goats. You can lose yourself in the synth-screeching rhythms by peeping the jiggly, goat-assisted clip down below.